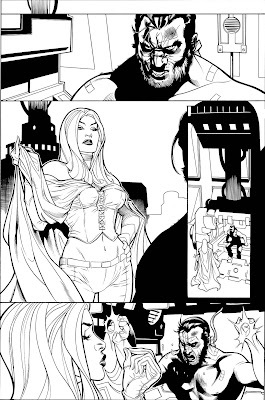 Rachel's inks for the page. 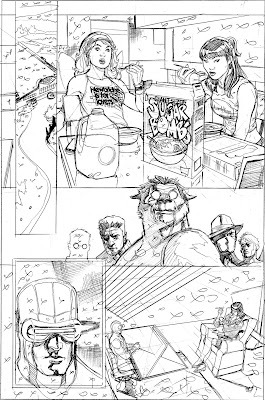 OK, final pencils except writer Matt Fraction had asked me to add in the "newbridge is for lovers" t-shirt for Pixie in panel 2 after he saw the scan of the page. 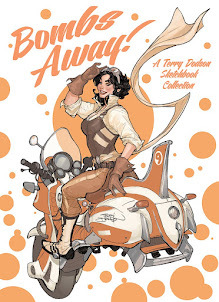 So here I was dropping it in via Photoshop while Rachel was inking the actual page. 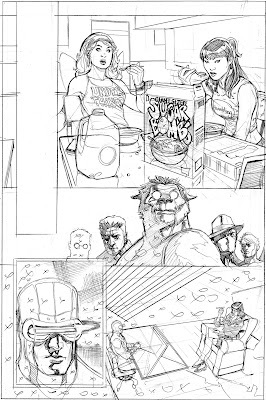 My favorite part of the page is the box of "Giant-Sized Sugar Bombs" cereal - I was rereading Calving and Hobbes at the time. I took a photo of a milk jug and a cereal carton for panel 2. 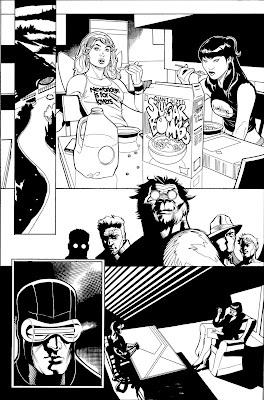 I already drew page 19 first, so I already knew the setting, lighting, furniture for the bottom panel of Cyclops and the mayor. 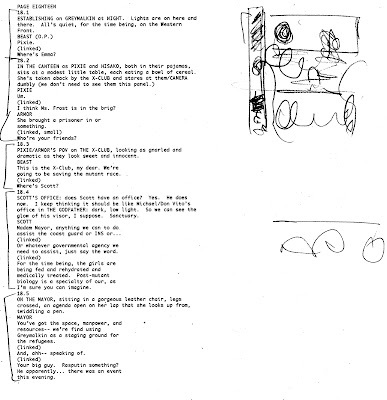 So we start off with page 18 script and layout. Again, this was a ways into the issue so I already had a good idea of what the page would look like so no need for a real tight layout. 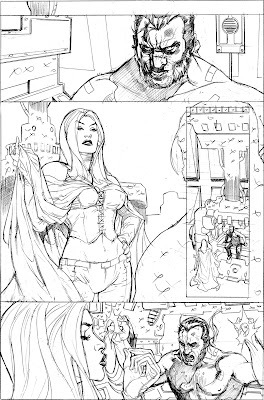 Also, this entire issue was drawn in 4 weeks as opposed close to 6 weeks for the first 3 issues in the arc so the most of this issue was drawn on the fly - optimizing shortcuts over details. 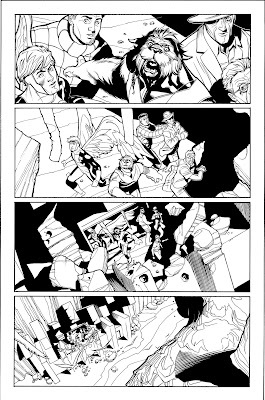 Interestingly enough, I think this is most solid issue page for page of the 4 issues. I had finally got a feel for how all the characters and locations looked. And I really prioritized crisp storytelling and solid drafting over everything else. 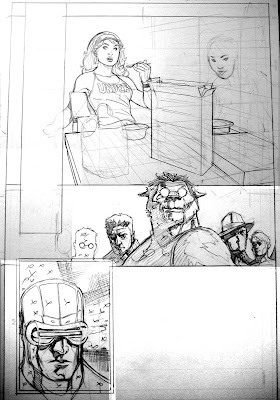 Not a real spectacular page - but you will see a number of stages going in the creation of this page. I always get the figures drawn first so as not to waste time fussing with background details - I will do this last as time allows - however the backgrounds and perspectives are are roughed in lightly. Rachel did a great job on Sebastian Shaw's scruff, in panel 1 of page 20 (just ask her)! 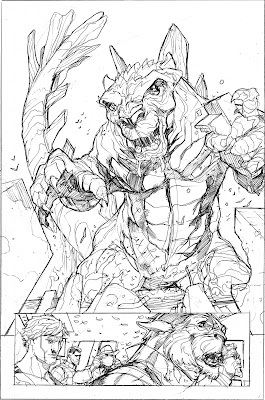 And how the final pencils turned out. OK, enough monsters, here's a little Emma Frost for you. 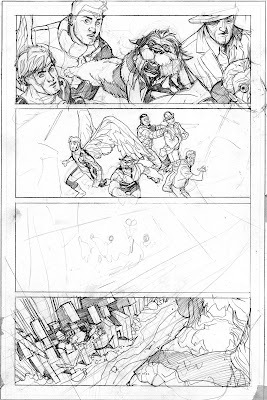 This page was later in the issue so by the time I got to it, I knew what it was going to look like, so no thumbnails. Also, the first 15 pages were all horizontal based pages because of the overlapping story and I had been dying to do some vertical panels. I scanned this one in as I wanted to doublecheck Emma as something was bugging me. The bottom panel is lighter as there is tracing paper over the top of it to prevent smearing. If you compare what I did with the monster here to 506, you'll notice this is a lot less humanoid than that version - I actually used a toy of the beaver character from the Narnia movie (don't ask why this was in the studio) as a basis for this version - it really helped with putting the eyes on side of the monster's face. I was really happy with how Angel and Beast turned out in the bottom panel. 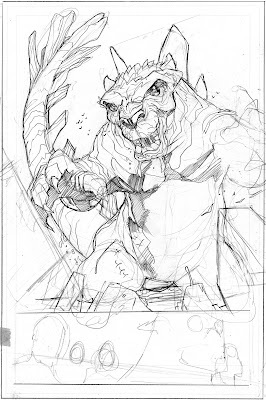 So here I roughed in the the monster and backgrounds for panel 1 and roughed all of panel 2. I scanned in the page to doublecheck on the proportions of the monster. Rachel inks directly over the top of my pencils with a brush and ink, and a little bit of crowquill, but mostly brush. Borders are done with Rapidographs. 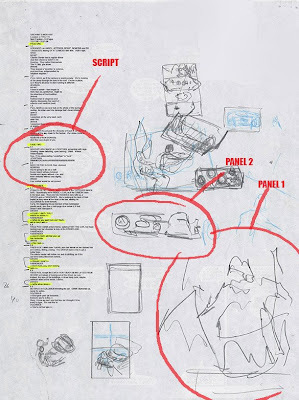 First off, here's Matt's script for pages one and my thumbnails. 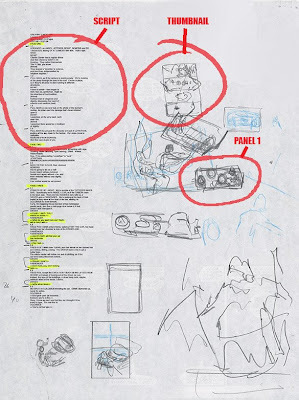 Also on this page is the script for pages 2 and 3 and my thumbnails for those pages as well. Here's the partially completed page. 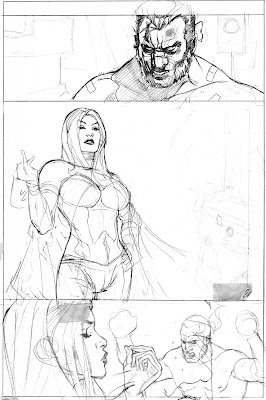 I've drawn all the major figures and roughed in the backgrounds and even roughed in the perspective for panel 3. I scanned this page in to enlarge the little drawing of the bunker I did in panel 4 and then trace off that enlarged version in panel 3. 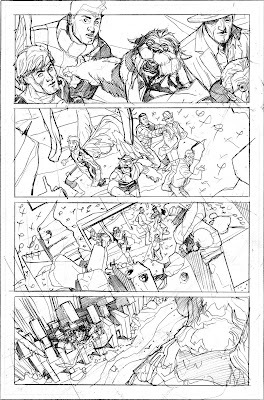 Here's the finished pencils. 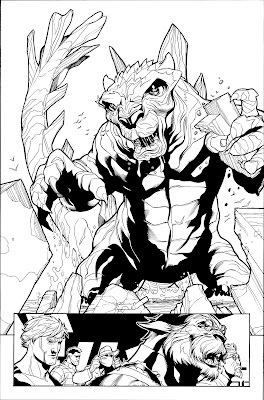 Note in panel 4, how I changed the shadow on the monster in the foreground. I spotted the blacks in panel 2 and 3 of what I did in the little building in panel 4. Next up Rachel's inks and Justin's colors. Here's a sketch I did recently of a Jungle Girl outfit (for the first time). Original art is drawn with a light blue Col Erase pencil and HB Lead on 7" x 10" watercolor paper.